Taking in the manic waterways of Bangkok. So you’ve landed in Bangkok bright-eyed and ready for adventure. Perhaps you’re on a layover, or heading north in a few days to Chiang Mai or south to the islands after checking out the sprawling mass of skyscrapers that make up the skyline of Thailand’s capital city. While the obvious choices for exploring this roaring modern city are its shopping complexes, towering buildings, and slew of top-rated bars and restaurants, there’s also a magical side to Bangkok worth checking out. Hidden almost in plain sight amongst the buzz of traffic and concrete jungle are the gilded ancient roofs of pagodas and Wats, sparkling palaces, and high white walls of this influential and sometimes secretive kingdom. Intrinsically related, the royal grounds and the waterways close by are a welcome relief to the modern hustle and bustle that envelope this grand city. Here’s how exploring these will have you feeling like a king, if only for a few hours. By now you probably know all about the city’s chaotic traffic, congested overpasses, cramped subway and MRTs, and the infamous tuk tuks that zoom from every direction around the city. But have you heard about the other mode of transport here? We’re talking about rivers: a network of canals (khlongs) that are basically the lifeblood of Thailand, to be precise. In fact, this network of watery thoroughfares is so impressive that it earned Thailand the nickname ‘Venice of the East’ for many years. The centrepiece of this network is the Chao Phraya River, or River of Kings. In ancient times, this mighty river irrigated fields, transported goods, and facilitated international trade, which has a lot to do with why the country became so wealthy. The ‘River of Kings’ title came about because all former and current kings of Thailand have travelled on this river in Royal Barge processions full of pomp and glamour. So it probably follows that by travelling on it yourself, you’re partway to being a royal yourself then, right? 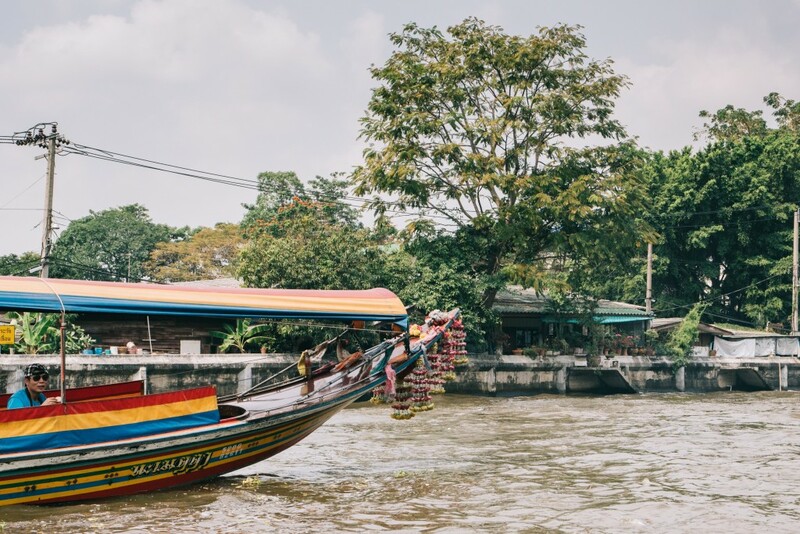 Today, the canals are full of longtail boats ferrying passengers to and from various stations — and they offer fascinating insight into some of the little communities around Bangkok that you wouldn’t otherwise see. Plus, they’re cheap (about 7 THB for one way) and the perfect way to relax and escape the Bangkok heat for a while! No royal day out is complete without a palace, right?! Bangkok’s Grand Palace is up there amongst the most beautiful in the world. Built in 1782 to house the royal family after the ancient Siam capital Ayutthaya fell to the Burmese army, the Grand Palace is an absolute heartstealer. Each of the four buildings open to the public are extravagant and exceptionally beautiful; golden trimmings and bright colours splashed across marble floors and intricately decorated columns. Enjoy your grandeur with some mystery and intrigue? Wandering the palace grounds teleports you straight to the heart of some pretty fascinating historical and pop-culture events, including the 1946 death of the previous king in mysterious circumstances. So devastated was the current king (his brother), that he moved out of the official residence permanently, only making use of it now for official ceremonial occasions. A glimpse of the palace is a massive tourist draw in Bangkok; over 100,000 people make the pilgrimage here every day. Get there early to avoid the crush of people and sweltering Bangkok afternoon heat. 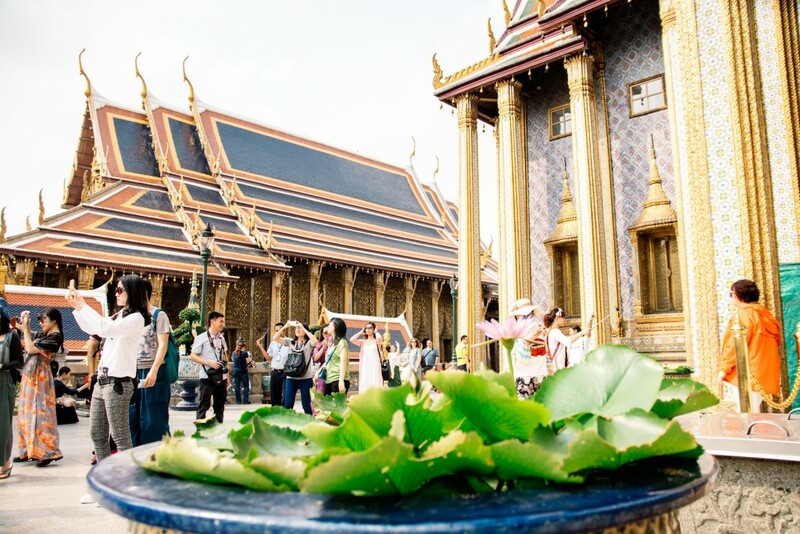 Inside the historic Grand Palace lies Wat Phra Kaew — the home of the highly revered Emerald Buddha. This depiction of Buddha in the meditation pose was carved from a single block of jade and dates back to the 15th century. It’s said that the Emerald Buddha brings prosperity and greatness to whichever country it resides in, which makes it the most highly revered image of Buddha (and may also account for some of Thailand’s booming economic growth!). This has made it the subject of a few moves as well, being finally brought back to Thailand in 1779 after General Chao Phraya Chakri conquered Vientiane. As can be expected when beauty and greatness are involved, the Emerald Buddha attracts an enormous amount of visitors each day — though thankfully the vast crowds almost melt away here as you move around the complex in spellbound awe of the intricate decoration and the riot of gold and colour at every turn. Across the road from the Grand Palace lies Wat Pho, a name far easier to pronounce than its official full name of Wat Phra Chettuphon Wimonmangkhlaram Ratchaworamahawihan. 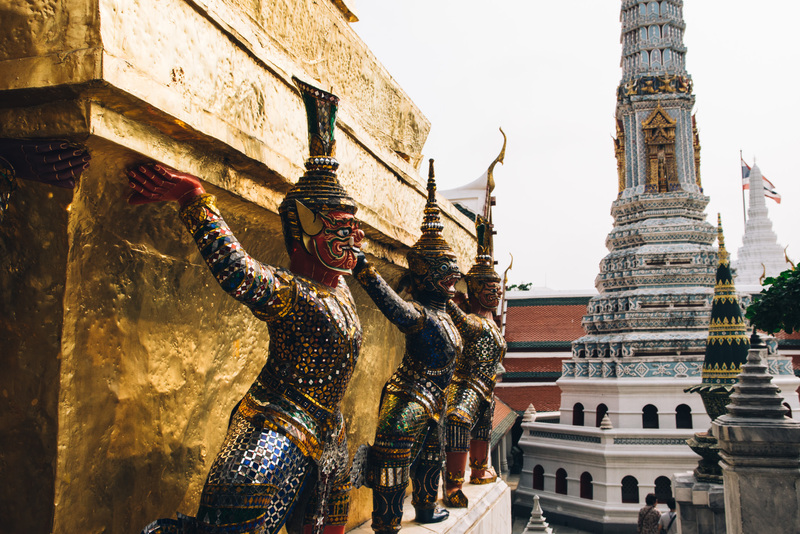 The complex is the first ranked of Bangkok’s few Wat Luangs (royal monasteries), and is home to some of the city’s biggest royal sights — figuratively and literally. Here, you can witness the extremely impressive and (much) larger than life Golden Buddha, reclining. His size defies both belief and his shelter; a hole was cut in the elaborately decorated roof to fit around the top of his head. Listen for the hypnotic chiming that rings out around the temple too, the result of small coins dropped into the 108 bronze bowls that line the walls by visitors seeking good luck. 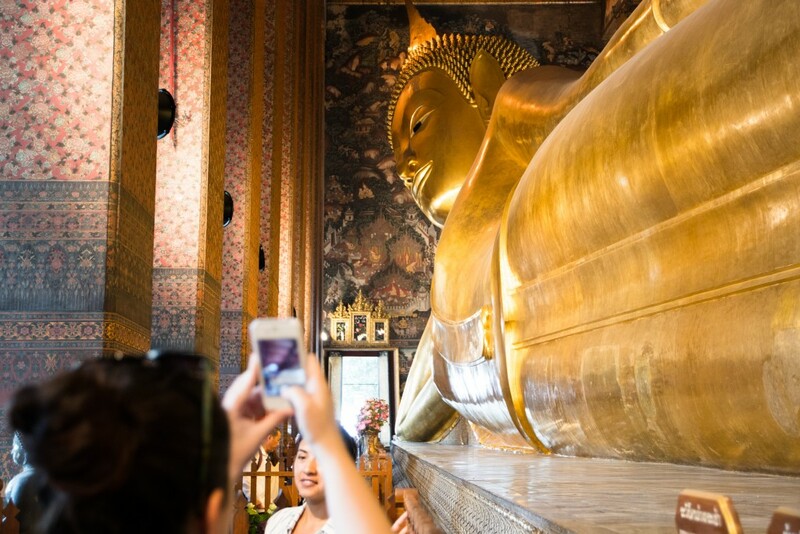 The crowds in the eight-hectare complex are much smaller than those at the Emerald Buddha and Grand Palace, which means you can take in all the sights — including 394 gilded Buddha images in Lotus pose — at a far more leisurely pace. Speaking of leisurely, while Wat Pho is pretty significant as the site of the earliest public university in Thailand, it’s also well-known today as the centre for traditional Thai massage and medicine. So what better way to end your day as a royal than by indulging as the royals would — with a traditional Thai massage? !